Over the last year I have been transitioning my work off my PC SOE to my MacBook Pro. 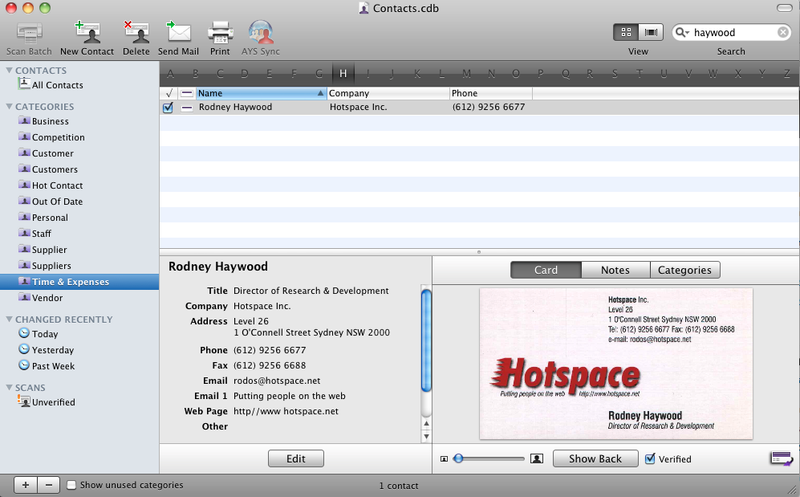 Until today one of the few applications I still had to run via my VMware Fusion Virtual Machine was my business card software. The business card scanner is one of my critical business applications, its from CardScan. I meet a lot of people and therefore collect a lot of business cards. To save time I simply throw them through the neat colour scanner which OCRs the text and populates fields. It then syncs with my mail and hence Blackberry so every contact is always at hand. Earlier this week I noticed that a Mac version was available and I was keen to give it a try. The fantastic thing is that CardScan don't do what you might expect and charge you all over again for the new software. If you own the scanner you can download the Mac version at no cost. Fantastic! The first hurdle was getting access to the software. For some reason many of the links on the support website don't seam to work from Safari. I had to contact support to get the actual download URL. Once I had the software and got it installed I was stuck on the serial number entry page. Turns out you need an updated serial number. Support sent me to another web page that would not work in Safari. I tried it from IE and it worked! You are required to enter your existing Windows software serial number and the serial number of the scanner. Now the software would pass validation and load up, happy days! The first very terrific thing about the application is the database support from the Windows version. I simply opened up the existing .cdb and all of my data was there. No data migration or transition. Well done CardScan! I scanned some new cards. First thing I noticed was it scanned a card and then processed it straight away, a much slower process. In the windows version it does not process a card until you ask it to, so you can batch scan real fast. Felt strange just because of the way I was used to do scanning but then I noticed that there is still a batch scan button. Great. The online help was good. I was wondering of how I would sync with my messaging application so jumped into help. Very quickly I was able to figure out that through preferences you can configure auto sync with your Contacts. The sync does not appear to be as sophisticated as it is in the Windows version but maybe it does not need to be, it just appeared fancy previously due to the difficulties of working with Outlook. The Mac version is exactly what I want, the same familiar features and facilities. Everything has worked just great once past the download and serial number issues. 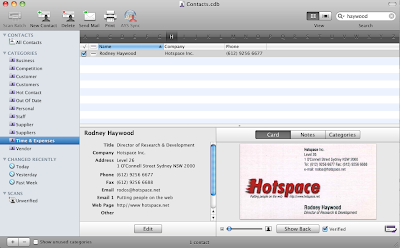 If as a Mac user you are after a powerful business card scanner, then check out CardScan. In my experience you won't be disappointed. Welcome to the Mac world Rodos! Now, if you can move yourself from the Crackberry to the iPhone, you can get rid of the scanner all together! Just use an app like WorldCards to snap a photo of the business card, then it does on-board OCR and saves it to your address book. Presto - all done - no intermediate device required. Please note that CardScan for Mac has a "Batch Scan" option (in the toolbar and in the menus) which allows you to scan multiple cards quickly for later processing, similar to the Windows option. Its a pity NO one at the helpdesk knows if i can import my database from davilex adresses de luxe. We have over 4000 customers in there, and dont feel like typing for several weeks. This why most companys have demo software for download so you can try and buy. Not at dymo.....nothing more then " we THINK it might work" now THATS what i call bad service.